Harry's sixth year at Hogwarts begins with the young wizard reluctant to return. After encouragement from Professor Dumbledore, Harry returns to the School of Witchcraft and Wizardry only to find a mysterious textbook marked as Property of the Half-Blood Prince. Harry soon learns that the book was the property of Lord Voldemort while he was in school at Hogwarts, leaving Harry to begin uncovering the dark lord's shadowed past. While Voldemort and his Death Eaters set out to unveil their deadly plan, Harry and Dumbledore seek to find a number of Horcrux's which hold the ability to destroy Lord Voldemort once and for all. 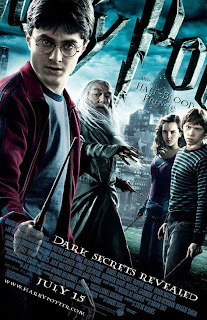 "Harry Potter and the Half-Blood Prince" is easily the best Harry Potter film since 'Prisoner of Azkaban'. David Yates, who took over the reigns to the Harry Potter franchise since 'The Order of the Phoenix,' seems to have settled into the series very nicely with his second attempt. So much so, Yates delivered a skillful vision to one of the lesser action-driven stories in the series. David Yates does a phenomenal job of focusing on the character development vital to the final two films in the franchise, leaving me eagerly anticipating the finale. Yates furthermore, does a capable job of interlacing the back story of Lord Voldemort at Hogwarts School of Witchcraft and Wizardry while also laying groundwork to the finale of the Harry Potter series. "Harry Potter and the Half-Blood Prince" is very much a setup book for the finale to the Harry Potter series. Within the story, Harry finally learns the true power of Voldemort and what he must do in order to destroy him. Unlike the other previous books, 'The Half-Blood Prince' is not so much about Harry refining his witchcraft, but more how now to utilize in order to defeat Voldemort and his evil plans. We finally see a confident Harry who is able and willing to make sacrifices in order to save all that he loves. Both David Yates and the entire cast do their best at making sure those themes are nailed time and time again in the sixth film in the series. Daniel Radcliffe continues to grow in his portrayal with every film and here in 'The Half-Blood Prince' he gives his best performance in the role to date. Radcliffe is a strong actor and as his character has progressed, so too has his skill. It is very nice to see him so confident in the role now, which also has a lot to do with the actual character development of Harry within the series. I never cared much for the timid Harry in the earlier films, but now seeing a refined Harry I have become far more connected with his character. Rupert Grint as Ron Weasley is another that I have really grown to appreciate through the years of the Harry Potter franchise. Grint like Radcliffe, has grown into his character flawlessly. He has always been very good providing a good comedic distraction, buy director David Yates and Grint have combined to give Weasley's character far more depth than the earlier films allowed. Weasley's character is another indicator of how well Yates understands the Harry Potter franchise. Yates dug a lot deeper than the majority of the previous directors have in character development and the result is a much more compelling stretch to the finish. I was utterly enchanted in all of the memory's of Tom Riddle that Harry is forced to re-live in order to piece together the clues of Lord Voldemort's power. A good portion of the film is firmly focused on Riddle's back story and both Hero Fiennes-Tiffin and Frank Dillane who play Tom Riddle at different ages do a fabulous job. It is not until the third act that 'The Half-Blood Prince' really gets moving and has some actual action involved, but all of the prior events leading up to the third act are enjoyable nonetheless. The Harry Potter series has always had outstanding actors as the Professors of Hogwarts and the latest professor, Professor Horace Slughorn played by Jim Broadbent is no differnt, absolutely perfect. Broadbent is a flawless character actor delivers a delightful performance as the Professor who holds the key to a important memory of Tom Riddle Harry must unlock. All of the returning professors are also wonderful in their performances again, with extra attention pointed at Alan Rickman who always stands out as Professor Severus Snape. Snape has a huge reveal that has been looming for too long and it was nice to finally see it play out on the big screen. Ultimately, "Harry Potter and the Half-Blood Prince" is a sombering realization that the franchise is coming to an end. The film leaves off on a major cliffhanger, with some disturbing turn of events that have been hinted at in previous films. 'The Half-Blood Prince' does leave the viewer eagerly anticipating the finale, but also saddened that the series is nearly finished. Director David Yates does a fabulous job of continuing his work helming the series and should prove to do justice to the final book, which will be broken into two parts.